He mentions children, victims of war, "from whom we take away the hope for a decent life," urging the parties to address "every diatribe with the tenacity of dialogue and negotiation and the power of reconciliation". As tomorrow marks 100 years since the outbreak of the First World War, "a day of mourning," we should learn the lessons of history. The Gospel makes us know the true Jesus, the living Jesus, who speaks to the heart and is a life changer as he was for Saint Francis of Assisi. "The joy of finding the treasure of the Kingdom of God comes through, can be seen. Christians cannot hide their faith." Vatican City (AsiaNews) - "Stop! I am asking you with all my heart. Stop!" said Pope Francis in a plea addressed "to the peoples and authorities" involved in three crises that presently occupy his "thoughts": namely the Middle East, Iraq, and the Ukraine. Putting aside his prepared text, the Holy Father addressed the pilgrims in St Peter's Square at the end of the Angelus today, and reminded them that "all is lost with war, but nothing is lost with peace." "Brothers and sisters: never war," he said. "My thoughts go especially to the children, from whom we take away the hope for a decent life: dead children, injured children, maimed children, orphaned children, children who have war relics for toys, children who do not know how to smile." Speaking about the three war-torn areas he mentioned, the pope also said he hoped to see that "the common good and respect for every person are put at the centre of every decision, not special interests." For this reason, he called on everyone to "continue to join me in prayer that the Lord may grant the peoples and authorities of those areas the wisdom and strength needed to push ahead on the path of peace, addressing every diatribe with the tenacity of dialogue and negotiation and the power of reconciliation." Francis' appeal vis-à-vis these three situations comes from the remembrance of the 100 years since the outbreak of the First World War, which will falls tomorrow, and which the pope called "a day of mourning in memory of that tragedy." The Great War in fact "caused millions of deaths and immense destruction. Such a conflict, which Pope Benedict XV called a 'senseless slaughter', resulted, after four long years, in a most fragile peace." "As we remember this tragic event," Francis went on to say, "I hope the mistakes of the past will not be repeated, and the lessons of history will be taken into account, ensuring that the demands of peace prevail through patient and courageous dialogue." Before the Marian prayer, the pope spoke about today's Gospel (Matthew, 13: 44-52), which mentions the parable of the hidden treasure and the pearl of great price. "They," the pope said, "tell us that the discovery of the Kingdom of God can occur suddenly, as was the case for the farmer who, as he ploughed, found the unhoped for treasure, or can come after a long search, as it did for the pearl merchant, who finally found the pearl of great price he had long dreamt of. "In either case, the main thing is that the treasure and the pearl are worth more than all other assets. Hence, the farmer and the merchant, when they found them, dropped everything else to buy them. They did not need to ponder, think, or reflect; they realised immediately the incomparable value of what they had found, and were willing to lose everything just to have it. " "The same goes for the Kingdom of God," the pontiff explained. "Whoever finds it has no doubts, he feels that it is what he was looking for, waiting for - the thing that corresponded to his most authentic aspirations. And this is how it really is: those who know Jesus, who meet him personally, remain fascinated, drawn by so much kindness, so much truth, so much beauty, and everything in great humility and simplicity." "How many people, how many saints, reading the Gospel with an open heart, have been so impressed by Jesus, that they were converted to Him. Let us remember Saint Francis of Assisi. He was already a Christian, but a shallow one. When he read the Gospel at a crucial moment in his youth, he met Jesus, and discovered the Kingdom of God, and then all his dreams of earthly glory vanished." "The Gospel makes you know the true Jesus, the living Jesus. It speaks to the heart and is a life changer. Thus, yes, drop everything! You can actually change around your life, or continue what you did before, but you are someone else, you are born again. You have found what makes sense, what gives flavour, what brings light to everything, what even causes toil, suffering, and death." "Read the Gospel, read the Gospel!" 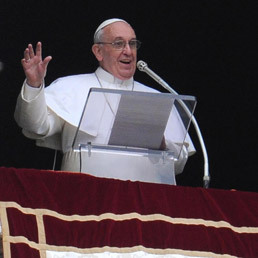 the pope said without reading his prepared speech. "Do you remember? We talked about it: read a small passage from the Gospel every day, carry a small Gospel in your pocket, purse, at work . . ."
"All this," he noted, "makes sense when in it, in the Gospel, we find this treasure, which Jesus calls 'the Kingdom of God', that is, when God rules in your life, in our life. It is love, peace and joy in every man and in all men. This is what God wants; it is that for which Jesus gave himself and died on a cross, freeing us from the power of darkness and moving us to the kingdom of life, beauty, and joy. Reading the gospel is to find Jesus and have this joy. Which is the gift of the Holy Spirit." "The joy of finding the treasure of the Kingdom of God comes through, [and] can be seen," Francis said in concluding. "Christians cannot hide their faith, because it comes through in every word, every gesture, even the simplest, everyday: the love God gave us through Jesus comes through. Let us pray, through the intercession of the Virgin Mary, that his Kingdom of love, justice and peace may come to us and the whole world."